* 각종 라이플 또는 스나이퍼건 등을 거치할 경우에 사용할 수 있는 리얼우드소재의 거치대입니다. * 이미지 촬영시 조명이나 모니터 해상도에 따라 색상에서 차이가 있을 수가 있습니다. 게임용 라이플을 한층 업그레이드 시켜줄 수 있는 최상급 옵션입니다. and display your long guns. 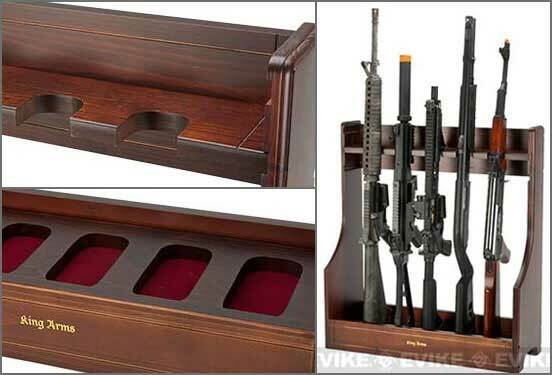 The gun rack is made out of beautifully stained real wood with a felt lined base. The height of the base and top rack are adjustable to suit long guns of varying sizes.